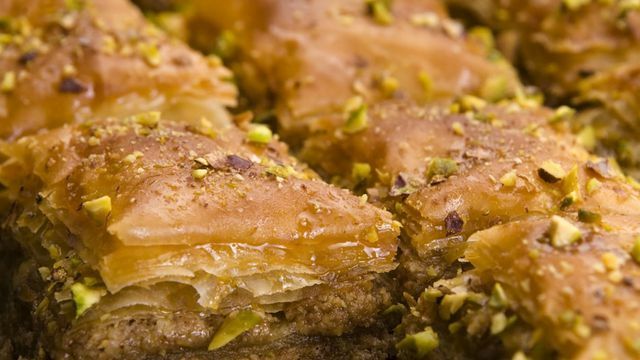 An ideal and good end to a delicious meal is a creative dessert such as Baklawa (Baklava). Combine nuts, sugar and rose water. Filo dough may be spread in a buttered 10 x 14 inch pan, brushing each layer with butter. Half way through the layering, place nut mixture in 1/2 to 3/4 inch layer. Continue layering buttered filo on top. Cut in diamond shaped pieces. Bake at 300 until golden brown. Pour syrup over baklawa, making sure the dough is well saturated. Garnish with minced pistachio (optional).